When you're preparing to move out of your house into another, one of the things that you obviously have to worry about is how to get your belongings transferred to your new place with minimal hassle. A common solution to this is the use of moving boxes. When you're packing up your belongings into moving boxes, it is imperative that you put each item in a suitably sized box. The larger the item, the larger the box it should be in. This will help to make sure that items don’t spill out of the boxes that you put them in, and your belongings are as secure as possible. First of all, you should know that while an extra-large box will provide more space than smaller sizes, it does not necessarily mean that you have to put more items inside of it. You do not necessarily have to fill up all the space, as this would most likely make it too heavy to carry around conveniently. Every moving box size is designed with specific item types in mind, and are usually equipped with features that support easy storage of such items. 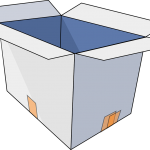 An extra-large box has average dimensions of 24 inches width, 18 inches in length and 24 inches depth. This bit of information should help you to weigh what items could go in them even before you purchase one. Usually, the sort of items that go in extra-large boxes include comforters, pillows, stuffed animals, seasonal clothing, towels, and pillows. You will notice that all these items are large but relatively lightweight. Extra-large boxes are not built for the heaviest items you have, as this would only make them too heavy to transport conveniently. If you’re purchasing an extra-large box, you should plan for it before you make the purchase. This is because of the aforementioned additional features. For example, a box that is built to store glass cups, plates or other kitchen items may be divided into compartments shaped to fit such items. Another similarly sized box that is built for storing large mirrors will not have these compartments. So, while both boxes are of the same size, purpose differs, and you cannot use one built for something else. Plan your purchase. Additionally, to simplify things a bit more, you should be on the lookout for extra-large boxes that are equipped with handles for easy lifting. Some even come with flatlock technology to make your packing easier! While you may have to cough up a bit more money for boxes like these, the amount of stress that you will be avoiding would definitely make it worth. Plain boxes may store all the items that you need them to just fine, but you’re not just packing. Lifting and transferring the boxes is a big part of the work you have to do and you should consider paying that extra bit for more convenience. Need moving boxes? Try out uboxes.com!